If this is your mantra, or if it's how you live even though it's not your mantra, then you, my friend, are a procrastinator. However, beating procrastination, while not simple, is a straightforward task that we can set our minds to. Once we know why we procrastinate and how procrastination works in our brains, we can come up with concrete steps to take that can help us overcome procrastination no matter how far along we are in the process when we realize what's going on. This is the first step towards getting anything done, and even the worst procrastinator usually knows what they are supposed to be doing. Sometimes our tasks are dictated by someone else (like a boss or a professor), and sometimes they are things that we choose. Either way, the very first step any procrastinator takes is to choose what they want to get done. Make sure that the tasks you choose are manageable and well-defined. It can be easy to say, "I want to write a book this year," but that's a huge job. Breaking it down into steps like, "I will write at least 500 words every day until the book is done" and "I will research how to form an effective plot," are more likely to get done because they are doable and it's easy to tell when you're finished. In our busy age, it's almost always possible to find something to distract us, no matter how hard we work to make sure that doesn't happen. Both procrastinators and non-procrastinators are bombarded by distractions, and it's nearly always easier to see all of the things that you could be doing right after you've chosen to focus on some task in particular. The computer and the online world are some of the biggest distractions out there. If you don't need them to complete your task, turn them off. All the way off. As in, hit the power switch and let the screen go dark. Same for your phone and your tablet and anything else that connects online. If you do need your computer, try installing an app like Antisocial that will help you use your computer more responsibly. This is where procrastinators and non-procrastinators part ways. While a non-procrastinator is often able to deftly avoid getting sucked in by distractions, procrastinators choose the instant gratification that comes from the distractions rather than prolonging gratification and getting on with the task at hand. Focus on thinking about the future. Consider how you will feel in an hour, a day, a week, or a month if you give in to your distraction, then think about how you will feel if you don't give in. The ability to delay gratification is tied to the ability to imagine the future, so practicing this will give you skills that you need to choose to focus on the task at hand, rather than on whichever distraction is the most enticing at the moment. Most people who procrastinate feel terrible about it, either at the time of procrastination or later, when they realize how much time they've wasted or when they feel the pressure of encroaching deadlines. Guilt is one of the most common of these emotions, though sometimes you may experience anxiety, shame, and depression, too. Let the guilt teach you. Instead of wallowing in your feelings or letting them overrun you, use them to teach you how to procrastinate less. Use the feelings to remind you that you are in the process of learning skills focusing on self-regulation, which is what will help you overcome your procrastination. If anxiety is key to your procrastination problems, make sure that what you want to accomplish is actually feasible in the period of time you have. Procrastinators tend to repeat this cycle with increasingly negative emotions until their deadline looms over them. They begin to feel like there isn't any hope for establishing a new pattern, because they keep finding themselves going through the same patterns over and over and over again. When you're feeling like the procrastination cycle might continue forever, remind yourself of past successes. Remember times when you have accomplished a difficult task, or just finished the thing that is before you. Replay these in your mind, rather than replaying your failures. When you procrastinate long enough, eventually a deadline will loom over you and will press in so close that you panic. There comes a time when you must get something done or the consequences will be dire. You might fail a class, lose a job, or worse. This is when a lot of procrastinators suddenly become highly motivated, because they don't want bad things to happen. While panic might make you act (it doesn't work for everyone), it probably won't help you produce your best work. Even if you have procrastinated for a long time, you will need to calm down before you can do the best that you can do in the time you have left. Give yourself a few minutes to breathe, and remember why you care about the project in the first place. 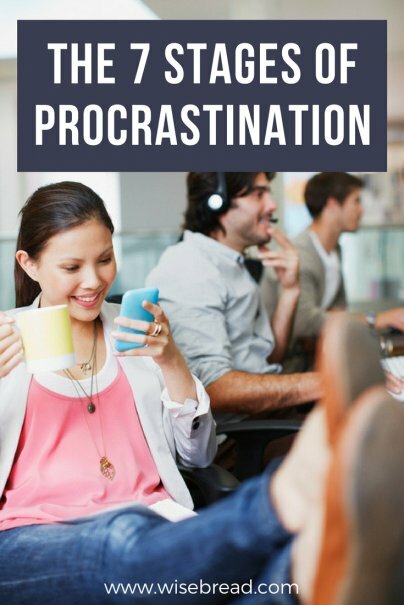 For the most part, procrastinators respond to panic and begin to work in a flurry, eventually producing some sort of attempt at completing the task they originally chose. This may not be their best work, and they may see all of the things that they could have done if they hadn't procrastinated, but many times they will, eventually, finish. If time is pressing in and you know you aren't doing the project the way you want to do it, consider other options. These won't always work, but they may help you produce something closer to your ideal result. You can ask for an extension on the project, and then set up accountability to make sure you work in the time that you have. Or, you can change the scope of the project so that you can do a better job in the time that you have left. Do you procrastinate? What steps do you take to overcome it?